Learn basic hand embroidery techniques plus make a zippered pillow cover at the same time. Easy & fun. 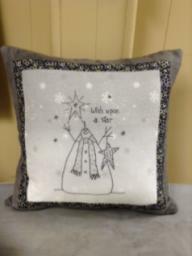 You can also use an embroidered square you have on hand or an orphan block for the center block. This is a new test message for Eileen by Keep&Share IT. This is a second test comment for Eileen. This is a third test comment for Eileen.